Daniel Perpiñan / Professor ESMUC Barcelona. Now accepting applications for the 2019- 2020 program ! Orchestral excerpts : Mahler Symphony No. 3 and Mozart Requiem. * 18 sessions in total. * Individual lessons, chamber music opportunities, Brass Ensemble, Low Brass coaching, and orchestral repertoire class. 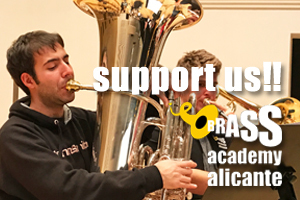 * Participation free of charge as auditor in the Masterclasses organized by the Brass Academy Alicante. * Opportunity to participate in the Sony and Freixenet Orchestras of the prestigious Escuela Superior Reina Sofía de Madrid and in the famous “Encuentro de música de Santander” . Condiciones y fechas de pago : leer bases de inscripción generales. 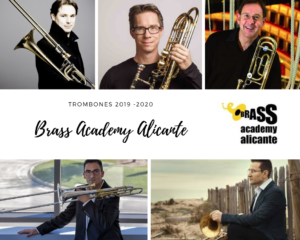 Certificates of study: Upon completion of the academic year at the Brass Academy Alicante, the artistic directors of the Academy present a Diploma of studies to the student, corresponding to the course of study completed in that year. * When making the transfer, please do not forget to include the details: INSTRUMENT – STUDENT’S FIRST AND LAST NAMES.